It is almost a reflex that we have, as teachers: if children are fighting over a toy, we put the toy up and give the children a chance to cool off, usually saying something like, “If you can’t play with the toy without fighting over it, then you won’t be able to play with it.” The problem with using this method is that most tug-of-wards over toys happen because children don’t know the words to use to express what they want, so they try to take. If we are simply taking the toy away and moving the children to another activity, they aren’t learning the words that they need in order to prevent a tug-of-war from happening again. Children need to learn how to stand up for themselves and say “NO” to another child that is trying to take their work, or even trying to harm them in some way. This teaches assertiveness, a key skill that children need that will enable them to stand up to bullying and other threatening behaviors later in life. The ability to be assertive also boosts self-esteem as children learn how to stand up for themselves, their desires, and their needs. When children are involved in a tug-of-war over a toy, we should first try to figure out who had the toy first. Teachers should always try to know who had what in the classroom so that they can easily solve these kinds of issues. Usually when I am doing a workshop, the words “Observation is SO important in the classroom” leave my lips at least once during the workshop. This is a time when observation is so important. It is important that we observe enough to know who has what, because we are better able to help children solve their social problems the more we know about the situation. 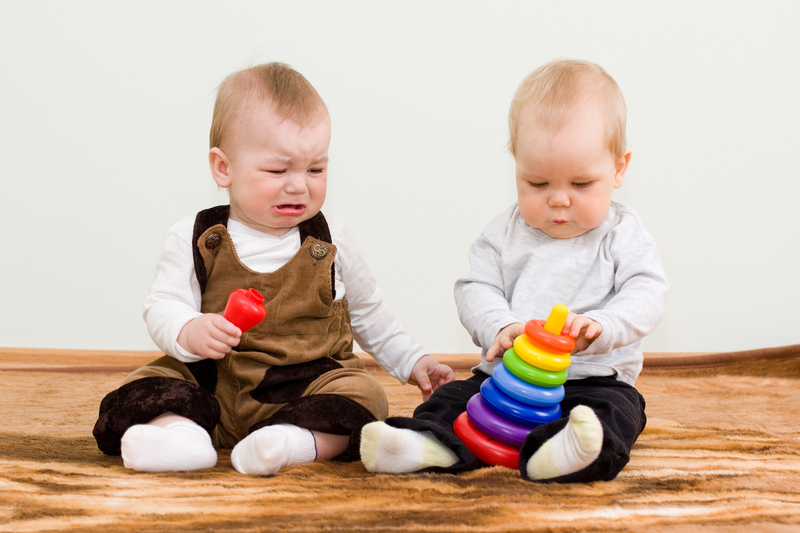 Once we know who had the toy first, we can coach that child to tell the other child “NO” or “I don’t like it” if they are a younger child (1-3 years old). If they are older, we can teach them to use even more words: “I don’t like it when you take my toy. Please give it back.” Usually, the words are enough for the offender to give back the toy. Our job during these altercations is not to hand down a sentence or an ultimatum; when we take toys and put them up, that is what we are doing. Our job is to coach the children to the solution. We have to back up the child that had the toy first by telling the offender, “He didn’t like it when you took his toy. You can ask him if you can use it when he is done with it.” This teaches the child the words to use if they want something that someone else has, and teaches him how to respect the rights of the child that has the toy. For younger children, we can simply say, “He is playing with this toy right now. Let’s do _________ until he is done with it.” This beginning step shows the younger child how to respect the rights of others, and helps them ease into an alternative while they are waiting for their turn. But I Already Told You, I Don’t Know Who Had The Toy! Okay, you really don’t know who had the toy, and this can be a real problem for teachers of younger children who can’t tell you who had the toy first. One thing that I have found through trying to solve this problem in my own classroom is that the child who had the toy first will be the most upset when it is taken. It is almost akin to the story of the Wisdom of King Solomon. When I worked with younger children and there was a tug-of-war, I would take the toy just to end the tug-of-war. Usually one child would move away and the other child would become more upset. I would give the toy back to the child that was upset. Any time you take something away from a child, it triggers a fight-or-flight response. The child does not feel safe any longer and reacts to this (hostile, in their minds) takeover by becoming upset. Different children can manifest this response in different ways, from crying to an all-out tantrum. Because we want children to feel safe and loved at preschool, we need to do anything we can to minimize the fight-or-flight response and foster connections and relationships with the child instead. This is one of the reasons why I say that it is SO important to be observant and know what is going on in the classroom as much as you possibly can. The more you know, the more you can do to help children who are involved in tricky social situations like this. Do You Have Any Questions About How To Handle Other Classroom Situations? If you do, just post your questions in the comments section below and I will try to feature them in an upcoming blog post! The word “mindfulness” has been thrown about quite a bit in the education field lately. Usually people use it to talk about meditation in the classroom and giving children a chance to experience the stillness of that but to me, mindfulness means something much greater to me. Being mindful means being aware of yourself in relation to others and being aware of others – aware of their feelings and their physical presence. It means being aware of your own emotions and how they affect you throughout your day. That is a lot for a young child to handle, and every day is a new lesson in what it means to be mindful. Yesterday I was watching several boys playing on the playground. They had tipped a wheelbarrow over onto its side and they were throwing rocks at it. Each time a rock hit the wheelbarrow it made a loud, satisfying sound. I enjoyed watching the boys as they threw their rocks at that wheelbarrow because they seemed to really be enjoying their sound effects. And then it happened. Since the boys were throwing rocks at the wheelbarrow, they eventually had to retrieve their rocks so that they could throw them again. One boy went to retrieve his rock just as another boy was throwing his, and it hit him in the head. Luckily, it wasn’t a big rock; otherwise this story would have a much different ending. But it was big enough that the boy started crying, prompting me to go over to him and ask him what was wrong (as if I hadn’t been watching their play). As if sensing the gravity of the situation and anticipating getting into really big trouble, the other boys scattered as soon as I came near them. I comforted the boy with the hurting head and called the others back over to me, explaining that no one was in trouble, but that I really needed them to watch out for their friends’ bodies when they get ready to throw a rock. No one wants to be hit by a rock, and getting hit by a rock hurts! I prompted them to make sure that their friend was okay, and then I coached them on how to look and make sure that no one was standing in between their rock and the wheelbarrow before they threw the rock. This seems like a very counter-intuitive way to handle a situation where boys are throwing objects that could very well be deemed extremely dangerous. After all, someone could seriously get hurt by a thrown rock. Someone did get hurt. But the boys had been throwing rocks for five minutes before someone got hurt. Five minutes is a long time when you are talking about boys throwing and retrieving rocks. The rock that hit the boy was not thrown with malice; it hit the boy by mistake which created a learning experience for all of us. That is what we need to be aware of when we look at different situations around the classroom and outside: what is the intent of the child. If the intent had been to hurt someone by throwing a rock at them, then I would have stopped the game and directed the children to something else. This was not the case, so there was no reason why the boys could not continue their game. They just had to be aware that they needed to look out for the other boys when they threw a rock at the wheelbarrow. Throwing rocks isn’t an activity that I endorse simply for the pleasure of throwing a rock, but these boys had another end entirely in mind: they wanted to hear the sound that the rock made when it hit the wheelbarrow. Because of that, I felt that there was no need to stop an activity that had such an innocuous goal. A little while later another teacher on the playground commented that the boys should not be throwing rocks and the game was ended. But valuable lessons were learned with the freedom to throw those rocks: the sound they make against metal, and the fact that they can hurt people so we need to be careful with them. Wise mindfulness lessons, indeed. I am starting to not like school very much. I used to love it because it kept me busy. It was challenging to juggle a few classes, my job, and my home life – keeping straight As in the process. The work itself wasn’t that challenging, but it kept me busy. Between semesters I would pick up my independent research as best I could (because I really couldn’t remember where I left off) and move forward with more engaging ideas. But a new semester would come and the non-challenging work would commence. This summer has been different. This is my second semester since I took a much needed year-long break, and during this semester my independent research never actually stopped. I made a commitment to this blog and to my company in June, and the work and research that I have done to keep that commitment has been much more stimulating and rewarding than school ever has been. I am even beginning to resent school because it inevitably takes some time away from the blog, the business, and the research. For starters, the research is much more interesting. I am currently reading Ungifted by Scott Barry Kaufman. I couldn’t put it down all last weekend, and I plan on reviewing it soon. That book blew my mind, and I’m not even done with it yet. It has given me several pieces of the puzzle of my first workshop, Encouraging Creativity in the Classroom. I have been working on and off with this workshop for about a year, but in the past two weeks I have renewed my efforts to make it great and actually offer it to participants. I can hear you saying, “Okay, where are you going with this?” Well, we are much more motivated to do things we are interested in than not, just like I am much more motivated by my interesting research and blog than schoolwork. The same is true of anyone else, including children. If the things we want children to learn are not presented to them in an interesting way, they will not be motivated to learn them. Sitting on a carpet reciting flashcards is not motivating or interesting. Matching games are interesting. Learning colors by using and naming them while doing are is interesting. Worksheets = not interesting. Learning math concepts with objects that can be manipulated = interesting. My youngest daughter is seven years old and is well into the process of learning to read. During the school year she had not seemed very motivated, but it occurred to me that she enjoys learning about things (her favorite subjects right now are bacteria, fungus, and mirrors). She has become much more motivated to read over the summer as she has picked up books in the non-fiction section of the library in order to learn about different subjects. This motivation has been born out of her interest in learning new things. In the classroom we would do well to remember that motivation is born of interest, and it isn’t simply about finding interesting ways to frame lessons. It is also about observing children to discover what their interests are and framing lessons around that. The children in my class were very into movie theaters about two months ago, so we made our own theater. We put on a mini-production of The Three Billy Goats Gruff, in which the children took turns playing the characters that they wanted to play. We made tickets, complete with the letter “T”. We made our own popcorn stand and practiced counting by paying for the popcorn with fake money. All of these lessons and skills were embedded into the movie theater theme. There was probably much more we could have done with the theme, but the the theme lasted for a few weeks and we tried to come up with several different ways we could build on the experience. But we did it based on a theme that the children were interested in. Had they been interested in restaurants, we would have explored recipes and created menus, practiced writing in a notepad while we took orders, did some cooking activities, used fake money to pay for the food, and anything else we could have come up with to learn while we explored restaurants. There are many different ways to include the interests of the children in learning, and creating a learning environment based on the children’s interests has a lot of other advantages to development as well. For instance, children learn social skills and how to handle different social situations, such as ordering food in a restaurant and taking turns playing different parts with their peers. This is ultimately what is meant by “learning through play”. Children don’t need much motivation to play; they play all day long. The challenge for teachers is to take that naturally-occurring motivation, along with the naturally occurring interest, and make a rich learning experience out of it. 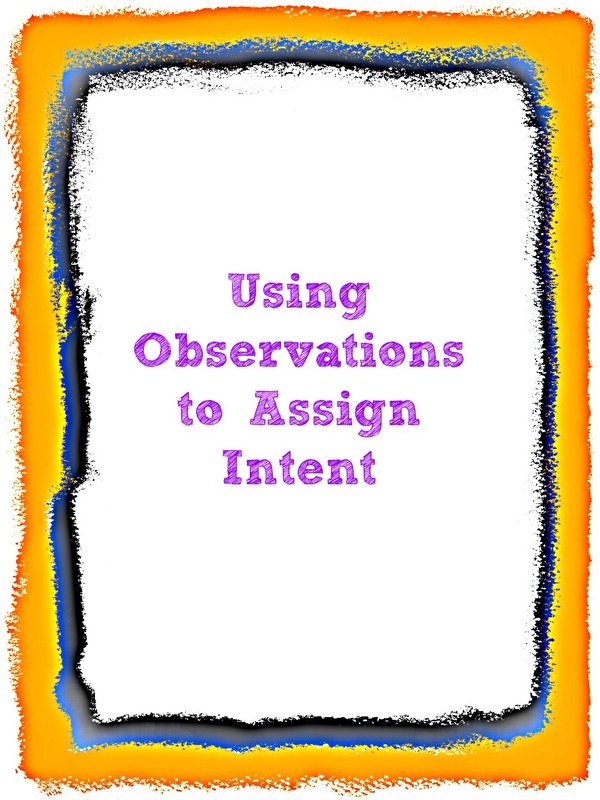 My post yesterday about Six Uses for Observation really got me thinking about how I use observation in the classroom. Observation seriously is one of the foundations of my teaching practice. There are several reasons for this, most of which are outlined in yesterday’s post. But one of the most important reasons is that it can change the way you look at children. Sometimes it isn’t even the way you look at children in general. Sometimes it is the way you look at one specific child. I recently wrote a post about how we as adults are slow to change our views about something. We think we know it all because we have been around a while and we take that knowledge for granted. We forget that sometimes it is important to slow down and try to see things from a different perspective. This is where observation comes in. If we just take a moment to slow down and observe a child in action, we may see something that is contrary to our previous view of the child. We may begin to attribute positive intent to the child’s actions rather than negative intent. If we open ourselves up to the possibility that there may be more going on with the child than we are presently aware of, we may find that to be the case. And if we find that to be the case, our view of that child can change dramatically. I know a lot of teachers out there shake their heads and roll their eyes when I say that children don’t do things without a reason. But the reason why I say this frequently and with authority is that I have done enough observing of children to know it to be true. The only way that we will be able to know or try to understand the intent of a young child is to observe for ourselves. And even older children may not tell us their intent because they are more worried about getting in trouble because of their actions related to their intent. 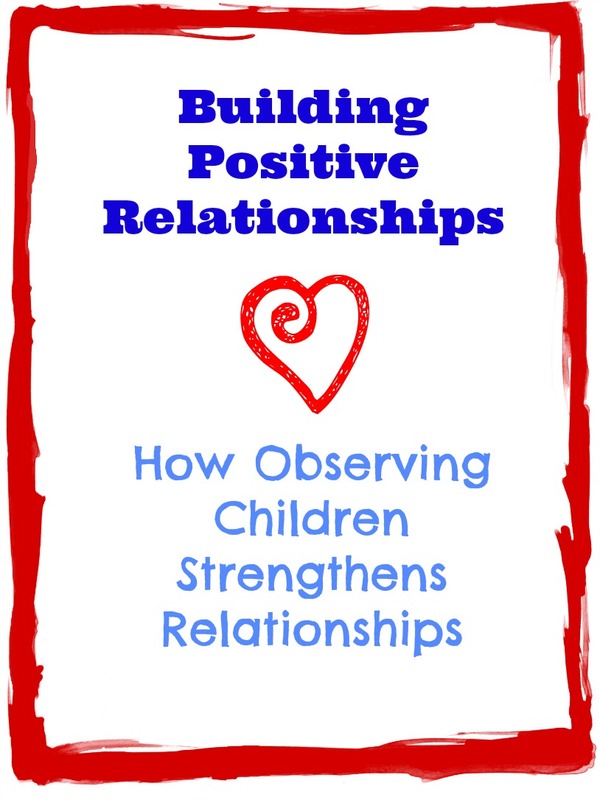 Observation has allowed me to truly be able to decipher the intent of children and come up with productive ways to deal with behavior in a non-punitive way. Let’s put this in context: Let’s pretend that you decided to try a different format for circle time because you felt that it would hold the children’s interest better than your current format. Your administrator walks in and wonders what the heck is going on and tells you in no uncertain terms that she does not like the new format and she doesn’t want to see it again. And doesn’t listen to your explanation of why you did it. How would that make you feel? The administrator paid absolutely no attention to your intent, only to your actions. That is what we do with children when we do not try to figure out their intent. I have had children display physical behavior simply because they want to play with other children but do not know how to approach them. I have had children hit or even bite others because they have issues with personal space. There are a myriad of reasons why children behave the way they do. And this isn’t just about children’s behavior related to other children. It can be related to the way children use materials, as well. I have had children drag chairs into the block area because they have built a television and want to “watch” it. I have had children bossing other children around, only to find out that one is pretending to be a baby and one is pretending to be a mommy, or – even more amusing – one is pretending to be a dog and the other is pretending to be the owner. I have had a house that the class built in the middle of the floor turn into a swimming pool in an instant, and everyone’s shoes and socks become strewn about in order to wade in the pool. I have had countless scenarios happen in the classroom, and the only way to sort it all out without hurting many feelings and tapping into my punitive side is to slow down and observe what is going on. So how does this strengthen relationships? Well, as I pointed out at the beginning of the post, it changes the way you look at children. You begin to see what they are thinking about, what they are interested in, what they need to learn on an individual basis (as opposed to what the class is learning as dictated by the lesson plan), and you simply get to know the children in your class on a more personal level. If observation happens frequently enough, it helps to form a direction that the class can take in order to achieve the maximum amount of learning possible, because the ideas of the children are present – because you know what they are. In short, it helps you to get to know the children in your classroom better. And that helps you to deal with the children in your class positively, which strengthens and enhances your relationship with them, and their relationships with each other. 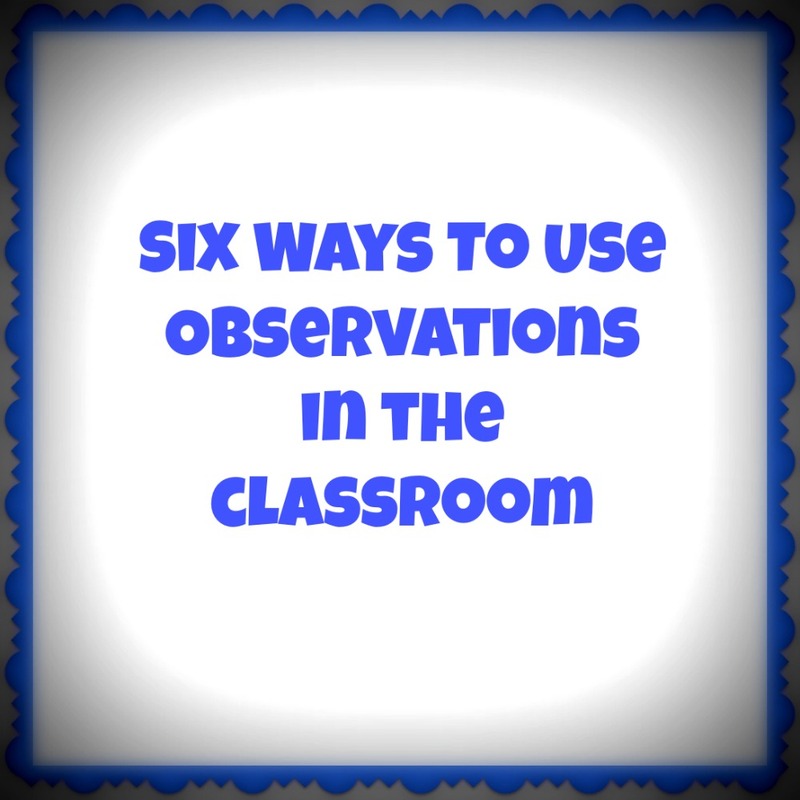 Observations can go a long way in the classroom. From watching a child explore a new concept to discovering how children interact with other socially, observation can be an indispensable tool when it comes to teaching skills in the classroom. Through observing children, we can find out different concepts and ideas that they are interested in. Just as the boy inspired me to begin looking into pulley and pendulum activities, different activities and conversations around the classroom can be the basis for new activities and projects. I once had a couple of boys in my classroom who were obsessed with sliding trucks down the slide on the playground. This observation led to a long term project about ramps, roads, and bridges. Children obsessed with parties can wrap presents, bake a cake, and do other activities related to parties. The key is to find an interest and brainstorm ways to expand on that interest. Perhaps, through your observation, you witness one child take a toy from another child, who then retaliates by hitting the child. From this observation you can conclude several things. First, the child that took the toy needs to be made aware of how his action made the other child feel, and that this feeling prompted the child to hit. The child who took the toy also needs to be taught the words to use to ask another child if they can share or take turns. The child who hit needs to be taught the words that they should use to let a child know that they do not like it when they take their toy. There are many different learning opportunities that present themselves when children interact socially, because children have not learned the necessary language needed to productively deal with others. Add to this the fact that most young children are egocentric in their thinking, and the atmosphere is ripe for the teaching of social skills. I have a couple of boys in my class that like to put hollow blocks on their arms and pretend they are robots. I have another who stacks them end-to-end and pretends that it is a microphone. I have yet another who stacks a couple end-to-end and places a wide block on top as a TV. We have expanded on a few of these uses, including setting up a theater complete with a popcorn stand. Children seem to have the creativity in them to use different materials in any number of ways. Observing the ways that they use the available materials can provide inspiration for other materials that may extend their play, or an activity that may expand their knowledge about the topic they are expressing interest in. Observations of the way children use materials can also help identify where they are developmentally. There are several ways in which children’s thinking becomes obvious during observations. The first is the dialogue: What are the children saying while they play? Recording the dialogue (whether audio, video, or written) can help you determine their frame of reference in relation to the activity, and their misunderstandings or misconceptions about what they are thinking about. Recording these and reflecting back on them later can help you come up with activities or projects that will provide a new frame of reference or clear up any misunderstandings that are present. Another way observations highlight children’s thinking is when abstract ideas are seen as themes during play. Children like to explore ideas that may be difficult for them to comprehend, like life and death, good vs. evil, caregiving, and other vague ideas. Sometimes they reenact a scenario that may have happened at home or at school that they either do not understand or did not like the outcome. By observing children and then reflecting on the observations, we can spot themes, misunderstandings, and the points of reference of children. This can allow us to help children explore these topics deeper. Have you ever caught yourself saying, “He did it for no reason!” to explain the behavior of a child? Children always have reasons for their behavior, but they may not have the language to articulate their reason, or they may not have the skills or knowledge necessary to do something differently. By observing the child we can gain clues that can help us figure out why the child is behaving as they are, which can help us figure out how to teach him more productive behavior. From language skills, motor skills, social skills, and others, observations help us understand not only where a child is developmentally, but help us determine how we can meet the child where they are in their development and provide appropriately challenging activities and projects. Are there any other ways that you use observations? Tell us in the comments below! We love learning new things from other people! Sometimes in my classroom I feel guilty. I feel guilty because, while the majority of my colleagues plan circle time activities and implement them, or do small group activities with the children in their class, I simply watch children. In fact, I have been known to introduce a small group activity, model how it should be done, stick around for moral support, and then walk away – to watch. This technique has served me well for many years, actually, because it allows me a chance to see a child’s thinking without my interference or manipulation. I have watched children use materials in unique, surprising ways. I have listened to conversations that have opened my eyes about where a child is coming from. But most importantly, I have observed children in the throes of social situations to see how they handle them. This last example has driven co-teachers of mine bonkers. They can see that I see that there is a dispute, but I am doing nothing to stop it. I am simply watching and listening to a couple of very young children attempt to work out their differences. Of course, if things start getting physical, then I step in to help resolve the issue. But until then, I usually just sit back, watch, and listen. The reason for this is that I can learn a lot about how the children settle social disputes and what I need to teach them in order to make it easier for them to handle disputes on their own. A lot of times, I watch to understand why a child behaves a certain way. Especially with young children, physical actions against other children can be a sign that a child does not have the language necessary to deal with social situations, be they positive or negative. I have had a few children who have gone through my classroom who have not known the language to use to invite themselves to play with another child, or have lacked the self-confidence to approach other children. In most cases, this has manifest as physical aggression against the other child. There has been more than one case where I have had to shadow and watch a child, simply to discover intent. The important thing to realize is that children have intent. They do not do something just to do it. They act on their environment in order to figure out how it works, but they do not come into this world already knowing how to deal with other people. And as adults, we all know how complicated it is to deal with other people sometimes. We have had years of practice to hone our skills of language and social maneuvering. Young children have not had time to develop the language or the knowledge needed to handle social situations. It is our job, as teachers, to observe them as they interact with their peers so that we can learn what skills and language need to be taught. Recently my class began a unit on the Three Little Pigs. I always look forward to talking about this book with young children, because there is so much that you can do with it. I have only picked the book up twice so far, though, and haven’t even gotten through it once. The first time we started to read it, one of the children wanted to build a house. We moved all of the furniture out of the middle of the floor and set to work (you can read about what happened during that experience here). The second time we picked up the book, I stopped reading and started asking the children questions about what was happening in the story, to kind of get a feel for their thoughts and feelings about it. And I was very shocked by what I found out. Of course, being three years old, the kids didn’t have one important piece of information: wolves like to eat pigs. But I was very intrigued by the thought process here, and the connections they had made to reach this conclusion. See, I am a firm believer that children are mean for a reason. They don’t hit just to hit. Usually their feelings have been hurt in some way; sometimes it is not because of the child that they hurt, but by an outside source such as a teacher. So in my classroom we talk a lot about how our actions affect the people around us. If you take a toy the child isn’t going to like it and is probably going to retaliate. We talk a lot about using language and telling children that they don’t like something instead of hitting them. So the language that they used to talk about how the pigs were treating the wolf helped me to see that they are making a lot of connections between behavior and action. So what does this have to do with creativity? Creativity is about making these connections, and the children in my classroom who have been able to make these connections have come up with some creative ways to deal with each other socially rather than just having an all out free-for-all. They have begun to learn to work together toward a common goal, such as creating original ideas (like the swimming pool) because they have moved beyond thinking simply about themselves and what they want. They have come to see how their actions affect other people. Reframing is a powerful tool in this respect. When you practice reframing and teach it as well, it can totally change the dynamics of a classroom environment. It is extremely difficult and time-consuming to implement, but the rewards are totally worth it. Especially when you see a class of two- and three-year-olds assigning blame to the pigs in The Three Little Pigs! I have been wanting to write about SCLANS for a very long time, but haven’t really had the opportunity. SCLANS are the toys that teach this academic knowledge with the help of lights, buttons, and music. They are the toys that everyone clamors for their child to have when they are young, but drive peiple nuts while they are being used. I don’t necessarily have a problem with SCLANS, but in my personal experience they don’t tend to hold a child’s interest for very long. Button pushing is a relatively easy skill, after all. Some toys have pieces that move differently, and these pieces can prove challenging until mastered, but even that doesn’t take long, and when the skill is learned the interest is gone. We have talked about creativity being about finding your element, connecting dots, and experiencing many different areas of life in order to find an area that truly inspires you. But then we provide these toys to our infants and toddlers in the hopes that they will learn something from them. So what do they learn? If they push a button on the toy, it does something. Basic cause and effect. They will probably learn some songs and some basic motor skills. I haven’t seen the data on whether or not children retain any shape or color knowledge from those toys. I tend to doubt it because learning these things from a toy removes the knowledge from the context of the world around them. This means that understanding becomes limited, at best. In a previous post I spoke of my lack of understanding when it comes to math. I fully believe that if those advanced math classes had been taught to me in the context of the real world, my understanding and appreciation would have been greater. And isn’t that what we are talking about when it comes to creativity – learning through life experiences? I teach colors in my class through the children using the color and manipulating it. We talk about the colors of crayons, paint, markers, paper they are cutting, scissors they are cutting with, and toys they are building with. We talk about letters when I am writing their names or something that they have said. We learn about numbers through counting and matching amounts with numerals. The point is, we mix the learning with life. We move ourselves, we interact with objects; we don’t just sit around pushing buttons on toys. Through our interactions we have learned not only the academic knowledge, but social skills, vocabulary, fine and gross motor skills, and many different creative ways to use the information we have learned. This also promotes independence, self-confidence, and a love of learning. Learning in ways that require more work than just pushing a button is all-inclusive and can result in enhanced skills in many areas. For this reason, I do not allow SCLANS in my classroom. My job is to focus on more than simply academic knowledge. My job is to focus on the development of the whole child, and to increase their confidence and independence in areas other than button pushing, song singing, and academic knowledge.